Grand Master Riley Lee and Elliot Kallen stop by Studio A Wednesday 5/3 to chat with Doug Jayne about their upcoming concert exploring the surprisingly diverse world of shakuhachi - the traditional Japanese bamboo flute. 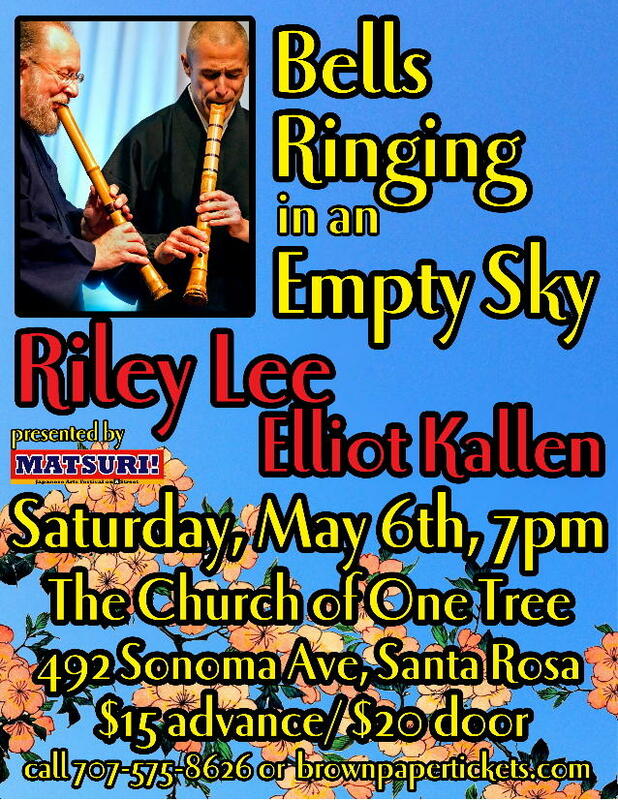 Shakuhachi Grand Master Riley Kōhō Lee and Elliot Kallen will be stopping by Studio A at KRCB-FM Radio 91 to visit with Doug Jayne at 1:00 pm, and talk about their upcoming show "Bells Ringing in an Empty Sky." The show is presented by the Sonoma County Matsuri Festival, and happens Saturday May 6th, 7:00 pm, at The Church of One Tree in Santa Rosa. This concert is a kick-off event for Sonoma County Matsuri, Santa Rosa's own festival of Japanese arts and crafts - taking place Sunday May 7th at Juilliard Park in downtown Santa Rosa 11:00 am - 5:00 pm.